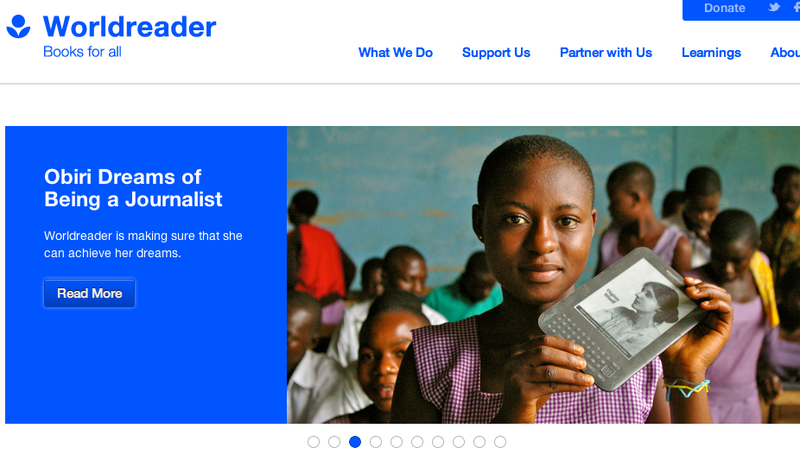 Last week, Seth Godin on The Domino Project blog issued a challenge to authors and especially publishers: donate ebooks to the nonprofit Worldreader, which loads them onto Kindles that are then distributed to kids in sub-Saharan Africa. The cost to the author and the publisher for each ebook donated to Worldreader? Zero. No one loses out on sales (the people who end up with these Kindles weren’t going to buy those books anyway) and the marginal cost of distributing an ebook is zero. Most of the authors we know have written books for more specialized audiences, which, like our book The Nimble Nonprofit, don’t really have audience among kids in Ghana (as Worldreader pointed out when they very graciously declined our offer to donate our book), but for those of you that have written books which might be appropriate, please consider contacting Worldreader and offering to donate your book to their efforts, and please consider as well calling your publisher and encouraging them to do the same. By the way, while the cost of donating your ebook is zero, the benefits are pretty amazing. As Gigaom reported last week, the results of the Worldreader program have been pretty impressive. Previous Previous post: The scarcest resource at nonprofits is bandwidth. Period.